My inspiration for these came from here - Preschool Play; they looked irresistible and went straight on my Pinterest Board of things to do. I finally got round to making them when I was near the end of my pregnancy with Poppy; I thought they would be a great addition to Jake's busy baskets (for when Im busy with baby things). I decided to fill the balloons with different things, rather than just playdough as I thought it would keep Jake's interest for a little longer. I decided not to add the faces to keep it simple, plus I or Jake can add them later to give them a new lease of life if necessary. Anything else you want to put inside; some ideas: flour, water or gel (if you're brave), lentils, beans, salt, sand. Jake played with these for about 5 or 10 minutes at a time; he talks about how each one feels and tells me the rice filled one is his favourite. They help him chill out for a little bit if and when he needs to; he doesn't sit still for more than 20 seconds normally so 5 or 10 minutes is miraculous! I also sit and play with them sometimes; the playdough balloon is great for working out some tension, and of course Jake loves it when I join in with his activities. :-) Highly recommend this for all ages! I love these too! The ones with rice are my favourite...good stress buster for Mummy too!!! I've always wanted to make these. You've inspired me to finally do it. I've pinned this! Love the new blog name too by the way! These are really cool. I have a slight balloon phobia, though, especially considering my 3 y/o still seems to have an oral fixation and they would probably go straight in her mouth. 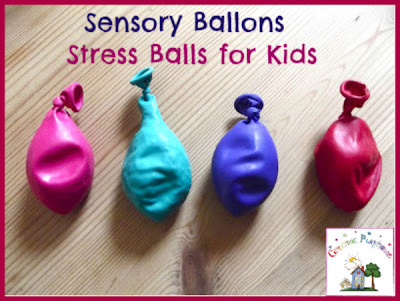 But these would definitely be fun for some supervised exploration. Thanks for sharing with the Kids Co-Op! 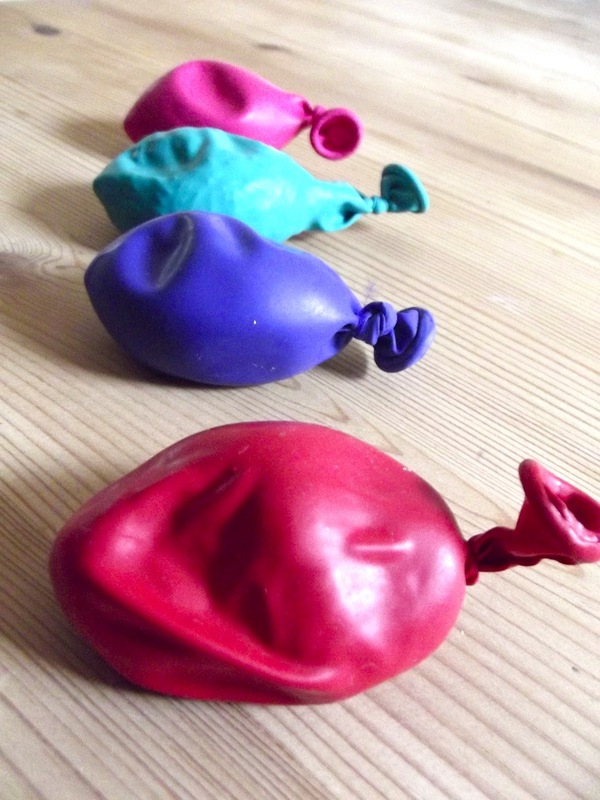 I hate balloons when theyre blown up - the noise they make when they're touched drives me mad!! But I can cope with them not blown up! You've just given me a great idea for some more sensory stress balls though - pure lightbulb moment! Thank you so much! I'd like to try this. Is it difficult to get the material inside the balloon? Do you use a funnel or just insert the stuff by hand? Nice idea! oooh! i've always loved to play with these! thanks for linking this up to tip-toe thru tuesday! i just wanted to let you know that this was one of our top-viewed links at last week's party. so it will be featured at tomorrow's tip-toe thru tuesday! These are awesome! I am going to have to make some. I'd love if you'd link up to my Teaching Time for Toddlers post! I just made these, so cool: flour, playdoh, rice, lentils and puffed rice. Thanks for the idea! Thinking of making this for the women in trauma group that I co-facilitate. They sound great for adults too!! Design by Katherine Lockett. All Rights Reserved 2012. Powered by Blogger.